The Philips Sonicare DiamondClean Smart 9500 Series is my pick of the bunch because of its excellent features in a stylish package. It comes with a fantastic battery life, improved bluetooth connectivity and a whole host of other features to improve your oral health. The other versions of the DiamondClean Smart, the 9300 series and 9700 Series do not offer as good value for money. In comparison with the DiamondClean Smart, the Philips Sonicare Flexcare Platinum is functional and is missing some key features. 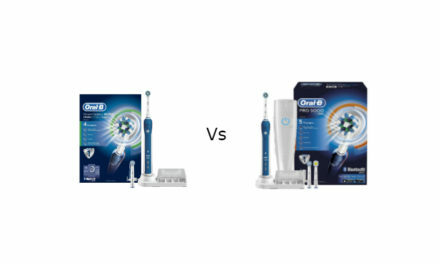 So which electric toothbrush is better Philips Sonicare Flexcare vs DiamondClean? The Philips Sonicare Flexcare+ is a functional mid-range electric toothbrush with a strong battery life and 2 minute quadpacer timer. It is missing a visible pressure sensor and does not have BlueTooth Connectivity. As it is missing a key feature in a visible pressure sensor, I would not recommend this electric toothbrush and would choose an alternative version. Philips Sonicare Flexcare Platinum Non-Connected is a slightly upgraded Philips Sonicare Flexcare+ as it has most of the features on this model and a visible pressure sensor aswell. As the non-connected name suggests, it does not have blue tooth connectivity so will not connect to your smartphone. The Philips Sonicare Flexcare Platinum Connected is the first Sonicare flexcare model to connect to your smartphone via bluetooth. It has a strong battery life, visible pressure sensor and 2 minute quad pace timer. Philips Sonicare Flexcare Platinum Connected with UV Sanitizer is identical to the Philips Sonicare Flexcare Platinum however also has a UV sanitizer. As this is the most complete Flexcare package and will allow me talk about all the different features in the Flexcare range , this is the electric toothbrush I will be comparing with the Philips Sonicare DiamondClean today. The Philips Sonicare DiamondClean Sonic – is a super stylish electric toothbrush that comes with a classy glass charger. It has a 2 minute quad pacer timer and a strong 3 week battery life. It is missing Bluetooth connectivity and more importantly the visible pressure sensor so I would not recommend this electric toothbrush. Philips Sonicare DiamondClean Smart 9300 Series – is the cheapest of the new Philips Sonicare DimaondClean Smart series. It features the new Sonicare Brush Heads with microchips in them. This allows for smart mode pairing. It has all the features of the previous Philips Sonicare DiamondClean Sonic along with a visible pressure sensor and Bluetooth connectivity. It comes with a reduced number of brush heads (3), no tongue care mode and no charging travel case. The Philips Sonicare DiamdondClean Smart 9500 Series -is the midrange model of the new Philips Sonicare DiamondClean Smart series. It comes with all the features of the Smart Series 9300, aswell as 4 brush heads, a tongue care mode and premium USB charging travel case. This model actually has all the same features as the more expensive Smart 9700 series and at a more competitive price. 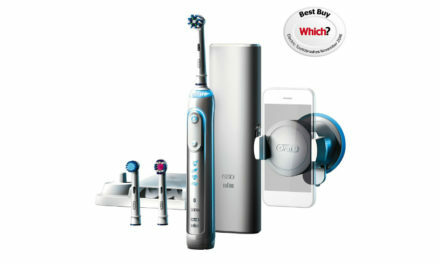 This is the electric toothbrush I will be comparing with the Philips Sonicare Flexcare. 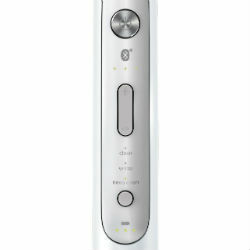 Philips Sonicare DiamondClean Smart 9700 Series – is the most expensive electric toothbrush Philips currently produce. It is the only Philips Sonicare Diamondclean model to come in lunar blue. 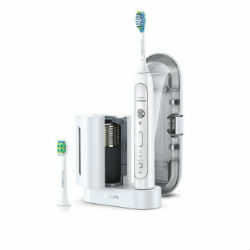 It has all the features of the Philips Sonicare DiamondClean Smart 9500 series however comes with 8 brush heads instead of 4 and a gold based glass charger. 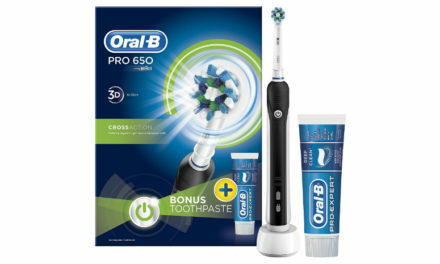 As there are actually no feature advantages over the Smart 9500 series, I would not recommend this electric toothbrush. Especially as it costs significantly more! In this detailed review I will be comparing the Philips Sonicare Flexcare Platinum Connected with UV sanitizer vs the Philips Sonicare DiamondClean Smart 9500 Series. Which electric toothbrush offers the best value for money? What features does each electric toothbrush offer? Find out more below. The travel case is much better on the Philips Sonicare DiamondClean Smart 9500 series. It can charge the electric toothbrush handle. It is also much better quality. DiamondClean Smart comes with 2 more cleaning modes than the Philips Sonicare Flexcare. Number of cleaning modes are not important as long as they have the standard “clean” mode, which both electric toothbrushes have. The DiamondClean Smart does come with a Tongue Clean mode which is actually useful. The Flexcare comes with a UV sanitizer whereas the DiamondClean does not. Although UV sanitizers do kill bacteria. There is no evidence that I am aware of, that this actually translates into better oral health i.e. less decay or gum disease. DiamondClean Smart 9500 series comes with a stylish glass charger, the Flexcare comes with a plastic charger. Does this make functional difference? No but the glass one looks nicer in your bathroom. The DiamondClean has a slightly longer battery life. The longer time between charging the better. The Smart 9500 series changes cleaning mode when different brush heads are attached. Neat but a bit gimmicky. DiamondClean Smart has a visual pressure sensor on the brush handle, the Flexcare only detects pressure when linked to the app. Smart 9500 Series comes with more and better brush heads. More choice of colour with the Philips Sonicare DiamondClean Smart. It also in my opinion a better looking electric toothbrush. The DiamondClean is clearly the more stylish of the two electric toothbrushes. It comes in a variety of colours (black, pink, white and grey). The black one which I am reviewing today is particularly sleek and exudes quality. The Diamondclean handle is easy to grip and well weighted in the hand, feeling not too heavy and not too light. It is also waterproof however do not put it into a dishwasher to clean it. On the front of the handle there is two buttons both of which are ergonomically placed. The top button is simply a power button which turns the electric toothbrush on and off. The second button changes the cleaning mode and the brushing intensity. Although you won’t be pressing this button too much because the built in microchips in the brush heads actually change this automatically. In between the two buttons are three lights which signify the brushing intensity. One light on being the weakest and three lights on being the strongest. Below the mode/intensity button there is a list of cleaning modes. These become backlit when selected. There are 5 cleaning modes in total but most of the time you will be putting it on the standard clean mode. Finally below the cleaning mode list, there is a battery indicator light and a brush head replacement reminder. Compared to the DiamondClean, the Philips Sonicare Flexcare Platinum handle looks functional and lacking style. The Flexcare Platinum comes in only one colour white, which looks clinical however uninspiring. The handle feels solid and well built. It is easy to grip and is well weighted in the hand. It is also waterproof so you can use it in the shower if you would like. On the front of the handle, the flexcare has three buttons which you can press. The top one is the power button which is similar to the Diamondclean. The middle button allows you to change the intensity of the cleaning mode. As the Flexcare does not automatically set the intensity dependent on the brush head, you will have to select the right intensity. I usually put it on intensity 3 (maximum intensity) and clean mode. The final button is the cleaning mode selector button. The Flexcare has 3 cleaning modes (Clean, White and Deep Clean) which is less than the DiamondCare. Number of cleaning modes are not really that important so long as the electric toothbrush has the standard 2 minute clean mode. The Flexcare is unfortunately missing a tongue clean mode, which I do use when I have a particularly bad case of morning breath. It is crucial for your oral health, that you brush for 2 minutes twice a day. I have written a detailed post about this here. Any aid that helps you achieve this goal will improve your oral health. Both the Philips Sonicare Flexcare Platinum with UV sanitizer and Philips Sonicare DiamondClean Smart 9500 series have a 2 minute timer. Only the DiamondClean Smart has a visible pressure sensor. This is an indicator light that flashes on when you are pressing too hard. I find it bizarre that Philips have only just started incorporating this feature onto it’s electric toothbrushes, given that Oral-B has been doing it for years. A visible pressure sensor will alert you to when you are pressing too firmly. The optimum amount of pressure to apply when using an electric toothbrush is 150 grams which is about the weight of an orange. Pressing more firmly than this can lead to a type of toothwear known as toothbrush abrasion. This can lead to sensitivity and gum recession in the long term. On the Philips Sonicare DiamondClean Smart 9500 series the visible pressure sensor is located on the base of the electric toothbrush handle. It is a little tricky to see when compared to the Oral-B’s pressure sensors but at least it has one! 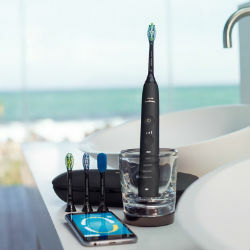 Both the Flexcare platinum connected and the DiamondClean 9500 has blue tooth connectivity to the Philips Sonicare Smartphone app. It is available on both iphone and android. One of the main features of the Philips Sonicare app is that it allows you to track where you have brushed through a location sensor in the electric toothbrush handle and then tells you where you need to Touch up. This is a fantastic tool to help you with your oral health. It is really common to have a preferred side whilst brushing your teeth, so having a tool to point this out is helpful. 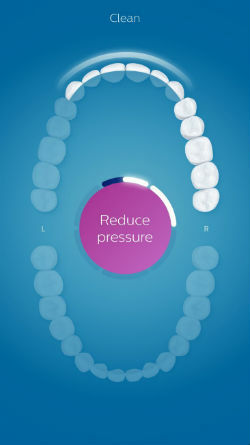 The app also allows you to set brushing goals and provides tips and tricks to clean your teeth better. Another great feature of the app is scrub detection and the pressure sensor. Scrub detection prevents you from moving the electric toothbrush too much when brushing. If you need help with electric toothbrush technique click here. The pressure sensor tells you to reduce pressure if you are pressing too hard. The location sensor on the Philips Sonicare DiamondClean Smart feels more accurate than the Flexcare platinum connected. This is also reflected by other user reviews on Amazon. Otherwise the bluetooth connectivity is similar on both. It would have been nice if both electric toothbrushes came with a smartphone holder, as it does feel weird holding your smartphone in the bathroom but perhaps I am being picky. I suppose the real question is does bluetooth connectivity really improve oral health or is it just a gimmick? It makes sense that tracking habits should improve them however there is no significant oral health study to back this up. The DiamondClean Smart is the only electric toothbrush to have these two features, the Flexcare does not have it. A microchip in the brush head sets the Diamondclean Smart cleaning mode and intensity for you. For example, the gum care brush head automatically selects the gum health cleaning mode for you. This will maximum save you a few clicks of a button, convenient but a little unnecessary especially as I only use one cleaning mode (more on this later). The brush head reminder light is only available on the DiamondClean Smart and not the Flexcare. The Smart 9500 series handle will notify you that the brush head is worn by beeping and a light appearing. This gives you a definitive point as to when you should replace your brush head, a bit like a car warning light. It is definitely a useful feature and better than fading reminder bristles. 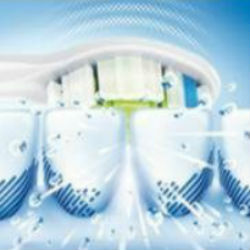 The sonic motion on the Philips Sonicare Flexcare and Diamondclean Smart is the same. They both brush at 31,000 brush strokes per minute so the cleaning power is exactly the same. Sonic movement has been shown to clean 21% better than manual brushing in several studies. 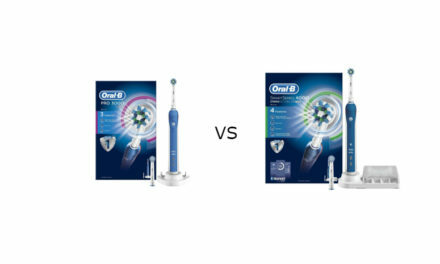 If you want to find out how sonic movement compares to Oral-B click here. The Philips Sonicare DiamondClean has an increased number of cleaning modes to the Flexcare. The Diamond clean Smart has five cleaning modes which are Clean, White+, deep clean +, gum health and tongue health. In comparison the Flexcare platinum connected comes with three cleaning modes, clean, white and deep clean. I personally think the number of cleaning modes is a gimmick because there is no clinical evidence that the different cleaning modes actually do what they say they do. Does the gum health mode actually look after your gums better? Well it lasts for three minutes which is 50% above the recommended time of brushing. Is it good to regularly brush for longer than 2 minutes? No because over brushing actually can wear down teeth. My advice would be to stick both electric toothbrushes in standard “clean” mode and put it on high intensity. The two exceptions to this is for people with sensitive teeth and with people who brush too firmly. In these cases a lower intensity may be preferable. All these brush heads have smart recognition so can be paired with the electric toothbrush handle. Out of the four brush heads in the box, I only use two on a regular basis. The premium plaque control brush head because it automatically sets the cleaning mode to “clean” mode and the tonguecare + brush head when I want to clean my tongue. The AdaptiveClean brush head is remarkably similar to the premium plaque control brush head on the Philips DiamondClean Smart. Both are snap on designed brush heads that are easy to put on and take off. They both feature flexible sides that allow the bristles to adapt to the contour of the teeth. This flexibility also allows the brush head to absorb some excess pressure although I would still not recommend pressing more firmly than 150 grams. The only difference between the two brush heads is the micro chip that allows for smart pairing and brush head reminder. Personally I think both the AdaptiveClean and Premium Plaque Control brush head is slightly too large, which effects its maneuverability especially to the far back teeth. It would be better if Philips came out with a compact version of both these brush heads. The InterCare Brush head advertises itself as “targeting plaque build up between teeth”. Now I want to set this straight right from the outset, this does not replace floss or interdental brushes. If you want to find a good oral health routine click here. The Intercare brush other than its advertising is actually pretty good. I like the size and shape. They also clean teeth well and are snap on brush heads. Even the Smart recognition brush heads partially work on the Flexcare like the Premium plaque control and the Premium Gum Care Brush head. The only part that does not work is the smart recognition and brush head reminder. Be careful not to buy the “screw on” brush heads like the E-series brush heads as they will not fit, they only fit on particular handles like the Philips Sonicare Essence. The Philips Sonicare Flexcare Platinum connected has a 19 day battery life, which is 19 days of use 2 minutes twice a day or 76 minutes of continuous use. In comparison, the Philips DimaondClean Smart 9500 series has a 21 day battery life, which is 21 days of use 2 minutes twice a day or 84 minutes of use. The DiamondClean Smart lasts slightly longer however both have impressive battery lives. Both electric toothbrushes have lithium ion batteries and take 24 hours to charge from completely flat to fully charged. Lithium ion batteries have many advantages including low discharge rates and being light weight. The Philips Sonicare DiamondClean Smart 9500 Series comes with a glass cup charger. It is extremely stylish and holds the electric toothbrush handle upright. The travel case also charges the electric toothbrush handle but more on this later. The glass charger charges the Philips Sonicare DiamondClean handle via inductive charging and operates between 100 to 240 volts. The only downside to the glass charger is that it is at risk of smashing if you drop it. Having said that, the glass is quite thick and feels sturdy. The Sonicare Flexcare Platinum comes with two types of charging station. The first one is a simple travel plastic charger, that is small and easily portable. It is more functional in design than the DiamondCleans but is still acceptable. 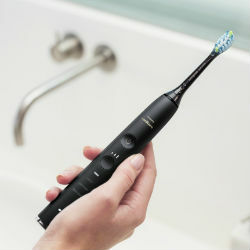 It works on 110-240 volts and has an induction charging pin, which holds the electric toothbrush handle upright. The second charging station has UV sanitizer attached. The UV sanitiser is well designed and holds upto two brush heads. Just open the UV sanitiser door, place the brush heads facing the internal lamp, close the door and press the green button. The cycle lasts for ten minutes before it is done. As stated above UV sanitiser has questionable benefit so it is up to you as to whether you use it or not. The dimensions of the Philips Sonicare Platinum connected and Diamondclean Smart are actually very similar. The DiamondClean is slightly longer and more slimline. Both electric toothbrush handles are the same weight meaning that there is very little difference in the portability of the electric toothbrush handles. The Philips Sonicare DiamondClean Smart 9500 series travel case is well designed with a black mesh like soft material. The inner part of the case is rigid and holds two brush heads and the electric toothbrush handle. One of the unique features of this travel case is that it also acts as a charging device and can be plugged in to a USB port when you are away on holiday. Admittedly you may not need to do this too often because of the 3 week battery life! The travel case comes in either black or white. Note that the Philips Sonicare DiamondClean Smart 9300 Series travel case does not have a charging facility. The Philips Sonicare Flexcare Platinum travel case in comparison is very simple in design. It is effectively a grey bit of plastic that covers the electric toothbrush handle and two brush heads. It does not charge the electric toothbrush handle and hence why Philips included a small travel charger in with the pack. The Philips Diamond Clean Smart 9500 Series currently costs $239.29 in the US and £254.99 in the UK. 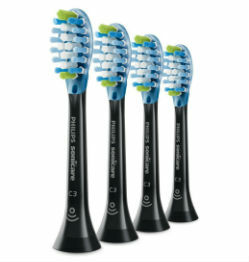 Philips Sonicare Flexcare Platinum Connected with UV sanitiser currently costs $199.94 in the US and £145.99 in the UK. 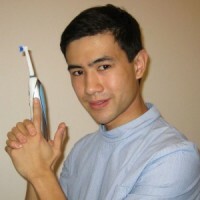 The Philips Sonicare Flexcare Platinum connected is cheaper, however does come with subsantially less features. As with most things, the more you pay the better the quality of the product. In my view, the extra cost for the Philips Sonicare Diamond Clean Smart 9500 Series is worth it. Both electric toothbrushes come with a 2 year limited manufacturers warranty that can be extended by 6 months by registering the product on the Philips website. A two and a half year warranty is standard for an electric toothbrush as warranties for different manufacturers fluctuate between two and three years. When comparing any electric toothbrushes, one of the factors that you have to keep in mind is the running costs. 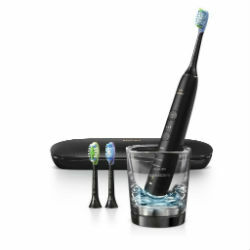 The Philips Sonicare DimaondClean Smart tends to use smart recognition brush heads to take advantage of the smart pairing and brush head reminder. These Brush heads tend to be more expensive than their non-smart counterparts. Having said that, you can use non-smart brush heads on the Philips Sonicare Diamondclean smart which will reduce the costs down considerably. If you do this then the running costs of the Flexcare and DiamondClean are the same. As a general rule, I would budget approximately $6-$7 for an Philips Sonicare brush head. Given that these last for 3 month, means that the running costs are around $2 a month which is alright. Philips brush heads are well made and have good build quality. I would always go for the genuine brush head rather than a fake. Both the Philips Sonicare Flexcare and DiamondClean smart have received a four star rating on multiple websites. With the DiamondClean Smart, people liked the bluetooth connectivity, the style of the handle and the easy charging. The only issues people had were in terms of the build quality, which were covered by the manufacturer’s warranty. With the Philips Sonicare Flexcare Platinum, people liked the cleanliness of their teeth and the different cleaning modes. The issues people had were in terms of the bluetooth connectivity (which does not seem as good as the DiamondClean Smart) and the build quality. As with the DiamondClean, almost all the issues were covered by the manufacturer’s warranty. What is better the Philips Sonicare DimaondClean Smart 9300 vs 9500 vs 9700? I think the Philips Sonicare DimaondClean Smart 9500 series offers the best value for money out of the lot. This is because it comes with a charging travel case and a decent number of brush heads. Is the Philips Sonicare Flexcare and DiamondClean Smart Waterproof? Can you leave the Philips Sonicare Flexcare and DiamondClean on the charger between brushing? Yes you can and according to the Philips website this will not affect the battery life ( I am a little dubious about this statement). What is the Philips Sonicare Flexcare and DiamondClean main competitors? 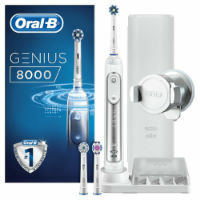 I would say there main competitors are the Oral-B Genius 8000 and Oral-B Genius 9000. Whether you go for a Sonicare or Oral-B really depends on your preferences. I covered this topic in more detail here. Does the Philips Sonicare Flexcare and DiamondClean come with a travel case? Yes they both come with a travel case. The more advanced travel case is definitely the DiamondClean Smart 9500 Series which comes with charging facilities. Do both electric toothbrushes come with UV sanitizers? No they do not. The Philips Sonicare Flexcare Connected does come with a UV sanitizer (if you chose that option). The DiamondClean Smart does not come with a UV sanitizer. This should not affect your decision too much as a UV sanitizer has limited (if any) oral health benefits. Would you recommend the Philips Sonicare Flexcare and DiamondClean to children? No they have not been designed with children specifically in mind. If you are looking for an electric toothbrush specifically for children, I would recommend clicking here. Does the Philips Sonciare Flexcare and DiamondClean come with a money back guarantee? The Philips Sonicare DiaondClean Smart 9500 series is my winner because it offers all the features you would ever need on an electric toothbrush in a really stylish package. 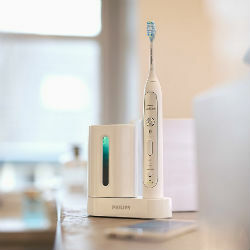 The Philips Sonicare Flexcare Platinum connected with UV sanitiser is functional in design however is missing key features like a visible pressure sensor and a charging travel case. Also the UV sanitiser is unproven so if you are going to go for a Flexcare, I would recommend the Philips Sonicare Platinum connected without UV sanitizer. Both electric toothbrushes will ultimately clean your teeth effectively, it really depends on your preference.